Discussion in 'Intermediate CJ-5 and CJ-6 Tech' started by Miller Mears, Jun 22, 2018. What wattage are the bulbs & how fast are they blinking? x2 on adding relays, that way the high current won't pass through the foot switch, pitting the contacts. power the lights with a short section of fused wire, with the relays close to the battery. Not the switch, the overload cutout on the back of the switch more likely. Some years have a thermal circuit breaker on the light switch. This breaker cycling on and off could explain the symptoms. A "plug and play" type halogen bulb, like the Silverstars, should not overload the circuit. However, the breaker could be defective and shutting off sooner than it should, or there may be other loads on the light circuit that push the circuit into overload, or the PO may have fitted lights with higher wattage than the "plug and play" type bulbs. The OP needs to put the year, model and equipment information in his post, or in his header file. This is what I put in my J20. Do it yourself. Not difficult. Lots of previous discussion if you search. 10 ga wire from the starter solenoid to a circuit breaker. Seen here is a red plastic weatherproof cover for the breaker, available from Del City or on Amazon. From the breaker, 10 ga wire in plastic loom goes across the firewall. 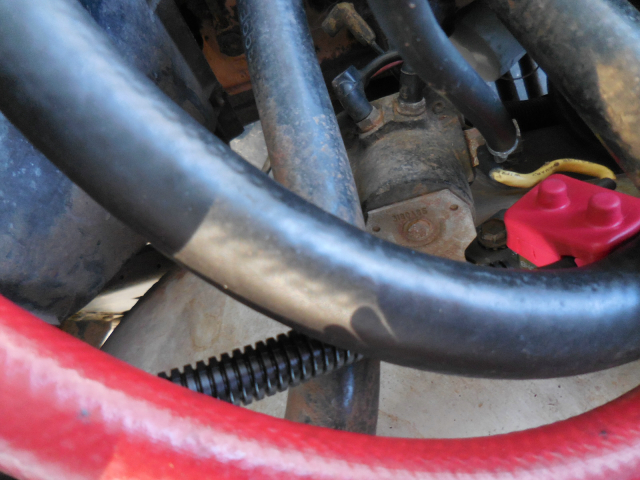 On an intermediate Jeep, the wires to the headlights go across the top of the passenger side fender, so the battery connection and relays are on the same side - no firewall crossing. 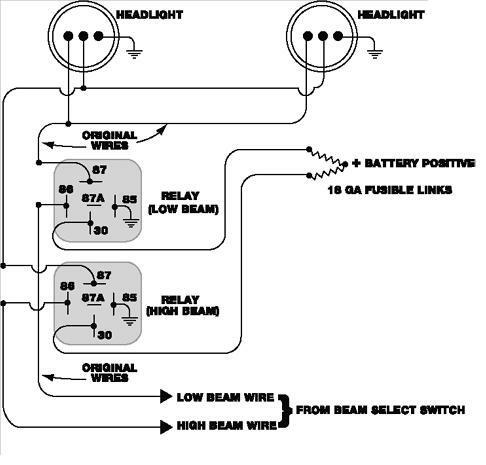 A relay for high and low beams each feed both headlight bulbs. These are the relay sockets and waterproof relays from Parts Express. You use the headlight switch to power the relay coils, and the relay contacts to power the lights via the 10 ga wire. I kept the existing grounds. If you upgraded the grounds it would have an effect, likely undetectably minor. This is ca $30 in parts, including wire. For a CJ would be less expensive than for my J20 since you need less wire. Another advantage of the relays is, because of the lower resistance, there will be less voltage drop to the light bulbs and yor headlights will be noticably brighter. ok sorry guys. should have come better prepared. 1974 cj, factory wiring harness and switch. Headlights are 53w 63w. ground connections are good. lights blink on about a 10 second interval. switch is "damm" hot to the touch. Now let me rephrase my question, is it cheaper to build myself a headlight harness or do you have a favorite. Thanks everyone for their input. The information that can be found on this site is truly amazing and the adult, drama free atmosphere is a rare commodity these days. OK, 63 watts is a bit hotter than stock. Eurospec bulbs are rated at 12 volt input, with the engine running @ 14.5 v charging voltage you'll be running closer to 75 watts each / 150 watts total for both- that's still only around 10 amps total. If your light switch is getting hot enough that you can feel it & it's tripping the thermal breaker then I think you've got bad switch contacts & the switch should be replaced. Adding the relay, whatever it's merits may be, will only be papering over the actual issue. You could replace the switch, but IMO attributing the problem to the switch does not make electrical sense. Heat results from resistance, and any resistance will drop the voltage to the lights. The lower the voltage exiting the switch, the lower the current through the bulbs. The heat dissipated by the switch subtracts from the power dissipated by the bulbs, making cycling of the thermal breaker less likely. I could be wrong (though I'm often right) ... measure! I kinda think heat at the switch indicates excessive current through the switch and breaker, not a failing switch, which seems to point to the bulbs as the culprit. I would not bother to measure, I'd just do the relay routine. To me it's an easy mod. I very much believe any headlight upgrade requires relays. Relays good. IMO it does. I stand by my analysis. Possible the conducted heat from the switch is making the thermal beaker cycle. Heat would have to conduct from the switch to the breaker, which hangs off its outside. Seems unlikely. Measure! do your own relay harness,the parts, relays , plugs ,breaker and wire are inexpensive at the flaps. get a new switch too. Walt Couch, timgr, Bowbender and 1 other person like this. Parts Express is cheap, ships fast, handles small orders well. 2 relays, 2 sockets, 1 circuit breaker, some wire and connectors. I prefer a circuit breaker to fusible links for this application. "12 VDC Waterproof 5-Pin Bosch Style Relay SPDT 30/40A with Metal Bracket" from www.parts-express.com! "12 VDC 5-Pin Relay Socket For Bosch Type Relay" from www.parts-express.com! Ditto on the breaker that was the first image I found to show how easy it really is. 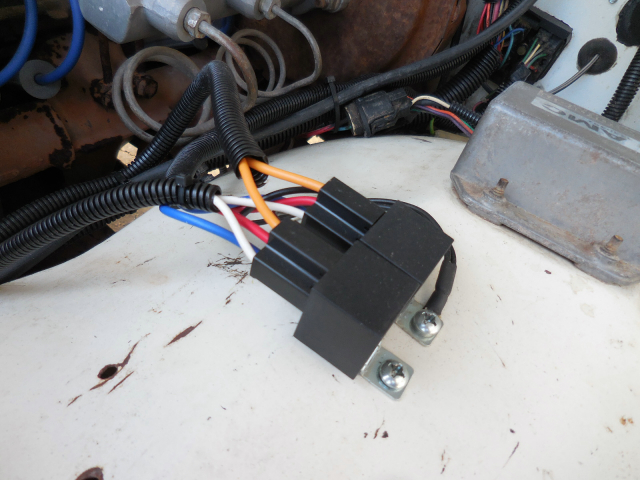 I have upgraded my headlights on my 74 cj5 with the h4's purchased a relay harness from amazon that plugs right in to the existing harness and fixed that blinking issue... the harness was only like 20 dollars. Search on amazon for : 2-Headlight H4 Headlamp Light Bulb Ceramic Socket Plugs Relay Wiring Harness Kit ... Its $21.95. This is the harness I purchased and it worked for my 74 cj5. Here are the key features the harness fixes... Dim Headlights, Flickering Headlights, Back Feeding Power, Malfunctioning Headlights when using Hi/Low Beams, Overloading the Headlight Switch, Overheating Plugs. If you are upgrading to Halogen Bulbs or are having trouble with your 7", 6", 4x6", 5-3/4" or any other H4 plug headlights not working properly, this is your fix!! THIS HARNESS BYPASSES THE POWER DRAW FROM THE HEADLIGHT SWITCH AND PULLS THE POWER DIRECTLY FROM THE CARS BATTERY, BUT STILL USES THE STOCK HEADLIGHT SWITCH TO ACTIVATE THE RELAYS TO TURN THE HEADLIGHTS ON AND OFF.